Property 3: Beckman Peninsula Spectacular Location! Property 7: Deep Creek Lake State Park is steps away! Six Bedroom Lakefront Log Home With A Dock Slip On Deep Creek Lake. Property 12: Six Bedroom Lakefront Log Home With A Dock Slip On Deep Creek Lake. Lake Access Log Cabin perfect for Gatherings. Community Beach. Tot Lot. Property 13: Lake Access Log Cabin perfect for Gatherings. Community Beach. Tot Lot. Cozy cottage w/ a stone fireplace & outdoor fire pit - close to lake access! Property 16: Cozy cottage w/ a stone fireplace & outdoor fire pit - close to lake access! 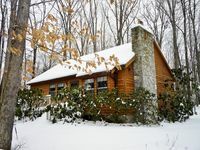 Cozy woodland cabin w/ deck - close to the lake, golf, trails, and ski slopes! Property 20: Cozy woodland cabin w/ deck - close to the lake, golf, trails, and ski slopes! Beautiful, Charming Lakefront Cabin With Stunning Views, Private Dock, Kayaks. Property 30: Beautiful, Charming Lakefront Cabin With Stunning Views, Private Dock, Kayaks. Lakefront home w/ private dock, hot tub, gazebo & incredible lake/ski views! Property 34: Lakefront home w/ private dock, hot tub, gazebo & incredible lake/ski views! Three Bedroom Cabin On Wooded Lot Near Lake. Secluded, Family And Pet Friendly. Property 36: Three Bedroom Cabin On Wooded Lot Near Lake. Secluded, Family And Pet Friendly. Lake Front, Private Dock, Hot Tub, and Wood Burning Fireplace. Property 41: Lake Front, Private Dock, Hot Tub, and Wood Burning Fireplace. Adorable Affordable Cottage, Lakefront & Dog Friendly! Property 45: Adorable Affordable Cottage, Lakefront & Dog Friendly! We travelled over 6000 miles to come visit some family in the area, and were thrilled that we'd picked this house. There was plenty of room for us and our four kids, and the collection of videos, games in the basement (bumper pool, foosball, and a Wii) and a nice yard kept them entertained during downtimes. 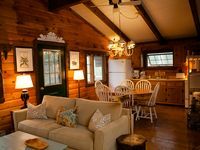 The location is gorgeous; we came right between the time when you can ski and when you can swim, but the area has great hiking and trails, and the cabin is a great spot on Deep Creek Lake; quiet, but not too far away from local sites and attractions. The house is fully equipped with a nice kitchen, washer and dryer, and what looked like great baseboard heating and air conditioning units, although we didn't need either of them (the heat did stay at the default 55; I suppose it must have been on at night). We'd return in a heartbeat if we could! Absolutely amazing cabin. The scenery is great and Dale was super helpful with his suggestions and quick responses on any questions we had. We couldn't have hoped for a better place to stay while in Deep Creek. We hope to come back in the future.